I used to be an Insane Clown Posse fan. Not a Juggalo, mind you, just a guy who was really into the Joker’s Card mythology and sort of bowed out after The Wraith. During that time, I got more and more into horrorcore, rap that is based around horror movie themes and designed to be shocking and frightening. Blaze Ya Dead Homie, Twiztid, and especially Kung Fu Vampire were all great acts, but as time goes by I consider their work more horror-flavored than actually truly frightening. So with Halloween starting to invade stores and the nights about to grow longer and darker, the question is: what is a scary rap song, really? For the most part horrorcore misses the mark. When you pluck the gaudiest, bloodiest horror-film tropes and use them as lyrical shorthand you almost always dissolve into camp; they’re lazy. And it seems a little weird that one of the most confessional and lyrical art forms—rap—rarely seems to reach down into the human soul to draw up gibbering terrors. The one really terrific example of a master of hip-hop horror is Eminem—and yes, I am aware that he is often lumped in with horrorcore, but a hockey mask does not a monster make. 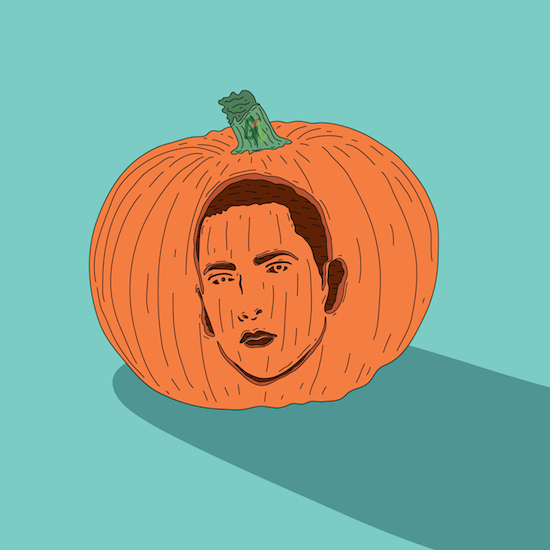 “Stan,” the 2000 confessional track in which Eminem portrays his own obsessed fan, descending deeper and deeper into a homicidal madness, is an example of a type of terror that only rap can deliver. The last verse has Eminem switching back to himself answering Stan’s letter, only to realize that the person he’s writing to is the person he saw on the news last night. Sure, the “deranged fan writes a rock star” premise in pop music was already old. Most people know The Police’s “Every Breath You Take” is actually about a stalker, which makes its popularity as a wedding song a little creepy. Sarah McLachlan did it even better with 1993’s “Possessions,” which was inspired by a fan who had concocted a fantasy that they were secretly in a relationship. Earlier this year Christopher de Groot started developing an entire opera based around the life of Richard Lopez, the Bjork fan who became so obsessed with her he mailed her an acid bomb. But it’s the delivery that makes “Stan” so unnerving. Eminem’s projections of the fan draw from deep wells of insecurity. By the end of Stan’s terrible rant he has become almost a parody not only of himself, but of Eminem’s public image. When Eminem returns to himself as a real person responding to Stan, the effect is a blow to the chest. All the terror and anger stands even more in contrast as he politely inquiries about Stan’s girlfriend and includes a signed ballcap for Stan’s little brother. You could only tell this story in audio form to be this effective and only rap, with its unpretentious baldness, could do it effectively. ICP has, on occasion, managed to churn out deeper, darker works amidst the hatchets. Again, what it comes down to is telling a story, something they managed perfectly in “Echo Side,” a tune I fully believe is the only proper gothic rap song ever written. The song follows a man named Damian who is condemned to Hell but manages to escape into the bleak landscape outside. Wandering in the wasteland, his body begins to decay until he is forced to merely roll along. Horror needs progression. You have to move from safety to fear and from fear to possibility. In film these things use monsters and weapons to motivate us to root for the person being chased. You don’t have that in audio form. When it comes down to really opening Pandora’s Box in something like a rap song you have to be adept at explaining exactly what is happening and why it’s terrifying, but leaving enough mystery so that a listener can fill in their own personal demons. It’s rarely done.